42.5" x 32.4" x 3.75"
Andrew Staley Wing (American, 1931-2004) was one of many American abstract artists whose art was grounded in the forms, materials and cadences of nature. Born on September 14, 1931 in Greenwich, Connecticut, Wing grew up in an artistic East Coast family. Wing took classes at the Art Students League in New York City, where he was influenced by the burgeoning Abstract Expressionist movement. At Bard College, he studied art under luminaries Louis Schanker and Stefan Hirsch, graduating in 1955. 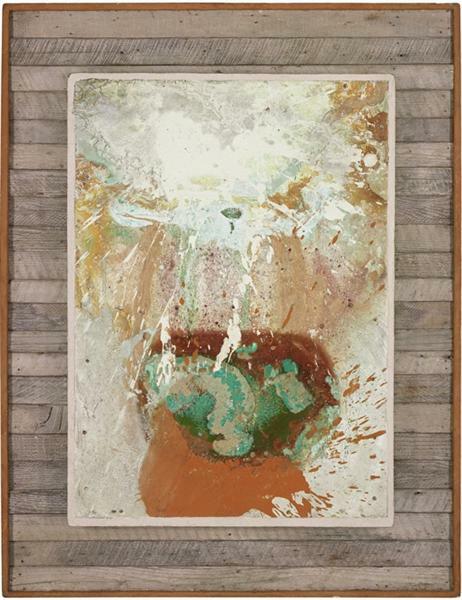 He moved to Laguna Beach, California in 1956 and received his MFA from Long Beach State College in 1962. Wing painted outdoors, often on the roof of his Laguna Canyon home, where, with various dramatic gestures, he would throw vessels of carefully mixed pigment and water solutions onto his explosive canvases. He was very much influenced by the patterns and palettes of the seasons, and would often strategically leave his canvases exposed to the elements to age and develop unique patinas. His forward-thinking passion for conservation often drove him to repurpose found materials in his paintings and constructions. Andy Wing died in Laguna Beach, California on February 3, 2004, two years after the Laguna Art Museum hosted a retrospective exhibition of his work, The Chances of Andy Wing. Wing received numerous awards for his paintings and drawings and exhibited throughout the country.